Leisure Painter and artist/explorer, David Bellamy invite you to participate in our sketchbook challenge. This is your final task in our six-month challenge. David has set you a drawing project to complete in your journal/sketchbook and offers practical advice on how to tackle it. Upload a scan of your best page on our website, PaintersOnline (see below for details), and David and LP editor, Ingrid Lyon, will select this month’s winner. Welcome to the August issue of Leisure Painter. 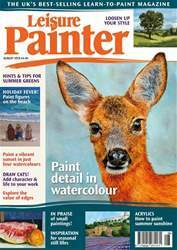 Aimed at beginners and amateur painters, this month's issue is packed with practical advice, demonstrations, tutorials and tips and techniques for drawing and painting your favourite subjects, from materials and colours to the techniques and ideas you need to produce beautiful paintings. Learn how to loosen up your style as you use outdoor techniques for painting at home, or how to transform a dull photograph into a vibrant sunset scene. Understand the value of edges in your work, how to inject life and character into your drawings and paintings of cats, and be inspired to paint summer-themed still lifes. There's a beginner's introduction to Brusho as well as demonstrations in watercolour, acrylics, water-mixable oils and oils.